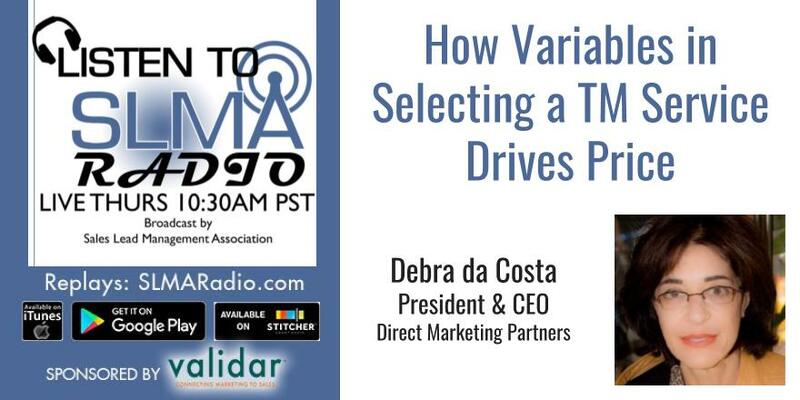 Host Jim Obermayer interviewed Debra da Costa, president of Direct Marketing Partners ands they tackled the difficult subject of choosing a "Contact Center" that is as measurable as your own staff. Why Marketing Automation needs Outbound Telemarketing! These two independent disciplines are becoming as interconnected as yin and yang. One without the other, some would say, is almost unthinkable. Outbound telemarketing can stand on its own, but can Marketing Automation? Debra da Costa of Direct Marketing Partners makes a case why outbound telemarketing is the lynchpin for marketing automation. Da Costa is an SLMA “2010 20 Women to Watch” winner, and voted in 2010 as one of the SLMA’s 50 Most Influential People to Watch in Sales Lead Management. As the founder of Direct Marketing Partners she has guided her company towards serving B2B customers sales lead funnel management needs. In that pursuit, she has researched new approaches and spoken at industry organizations like the SLMA, to evangelize new lead management process developments. Founder CEO of Direct Marketing Partners, a 20 year firm steeped in B2B prospect development and lead management services. Speaker on the SLMA Radio program on the topic of "The Evolution of B2B Lead Qualification"
Copyright © 2019 James Obermayer. All rights reserved. SLMA Radio is produced by Funnel Media Group on the Funnel Radio Channel.